The Öresund region consists of Southern Sweden and Eastern Denmark. It combines city environments - with their vibrant, cultural diversity - and relaxing countryside with beaches, forests and open landscapes. Explore the district on our 9-night itinerary. On arrival at Copenhagen Kastrup airport, take the train to Malmö across the Öresund Bridge. On arrival in Malmö, self-transfer to the MJ Hotel. Free time in Malmö to explore the city. The centre of Malmö is compact and easily explored on foot. Do not miss the picturesque Lilla Torg square with its colourful historical buildings and cafés with outdoor terraces, and the larger Stortorget square which is home to the 16th century town hall and the 17th century Governor’s Residence. If the weather is good, head to the park of Malmö Castle – a meeting place for locals and tourists alike – where you will find an organic garden and café. During the year the park plays host to many cultural and musical events. Overnight at the MJHotel, Malmo. Depart Malmö by train and travel to the town of Helsingborg (c.1 hour). On arrival in Helsingborg, self-transfer to the Grand Hotel. Overnight at the Grand Hotel Helsingborg, Southern Sweden. Opportunity to explore the historic centre of Helsingborg with its maze of cobbled streets, boutique shops and a medieval keep. The harbour of Helsingborg has recently been redeveloped and now is home to a selection of waterfront eateries and bars. Alternatively take the bus to the gardens of Sofiero Manor House on the shores of the Öresund strait. Sofiero was the summer residence of King Gustav XVI Adolf and together with his wife he created a beautiful garden oasis. Delightful to visit at anytime of year, although the riot of colour experienced when the 10,000 rhododendron bushes are in flower (May-June) is particularly spectacular. Travel across the Öresund strait by ferry (c.20-minutes - payable locally) to visit the castle of Kronborg in Helsingør, famed to be the inspiration for Shakespeare’s Hamlet. Built in 1574 the Castle is a UNESCO World Heritage Site. Continue your tour of North Sealand in Denmark by travelling by train to the Louisiana Museum of Modern Art (payable locally). More than a museum, it is a space where art and architecture meets parkland - find pieces by Picasso, Warhol, Rauschenberg and Kirkeby and sculptures by Moore, Calder, Ernst and Miro. Depart Helsingborg by train and travel to Copenhagen (c. 90 minutes). On arrival in Copenhagen self transfer to the Admiral Hotel. Overnight at the Copenhagen Admiral Hotel, Copenhagen. .
Day at leisure. Opportunity to explore the Danish capital. 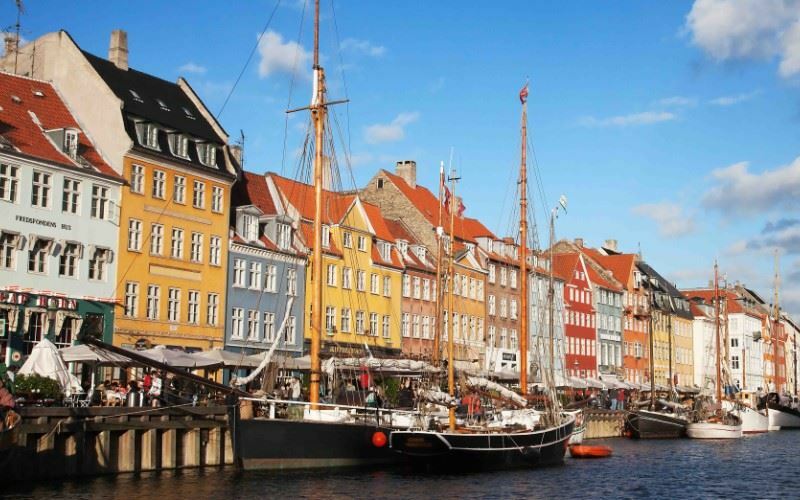 Don't miss the Little Mermaid; the 17th century Nyhavn; Strøget, the longest pedestrianised shopping street in the world and the fascinating National Museum. Overnight at the Copenhagen Admiral Hotel, Copenhagen. After breakfast, self-transfer by train to Copenhagen airport for the return flight to the UK. The town of Helsingborg affords wonderful views across the Oresund strait to the Danish town of Helsingor. A maze of cobbled streets, boutique shops and the keep from a medieval castle dominate the centre of the town, whereas the waterfront and harbour boasts a high density of with lively bars and restaurants. The town of Helsingborg affords wonderful views across the Oresund strait to the Danish town of Helsingor. A maze of cobbled streets, boutique shops and the keep from a medieval castle dominate the centre of the town, whereas the waterfront and harbour boast a high density of lively bars and restaurants. Housed in an opulent building in the heart of Helsingborg, overlooking the Stortorget (Central Square), is the Grand Hotel. Inside, modern interior design in the bedrooms combines with charming period features - high vaulted ceilings and wooden panels – in the entrance hall, restaurant and bar. A wonderful destination for a short break or as part of a longer multi-centre itinerary. The Copenhagen Admiral Hotel occupies one of the best positions in Copenhagen, directly on the waterfront and a short walk from Nyhavn and a gentle stroll from Amalienborg Palace. The hotel boasts superb views of the Opera House and the Royal Playhouse from its outdoor terrace, which proves popular with guests during the summer months after a day’s exploration. A former warehouse (from 1787), the property is handsomely rustic with wooden beams and teak furniture. The history of the Admiral Hotel, from its origins as a granary store through to a provider of hotel accommodation, is told through the interior design, photographs and artefacts which line the guest rooms and public areas. The result is a historic property which offers contemporary accommodation of the highest standard.